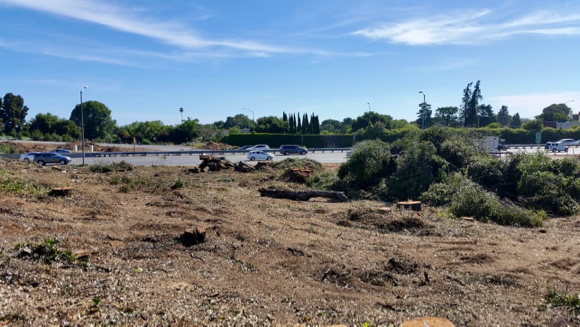 You may have seen something sad happening at the Willow Road/101 interchange: All the oaks and redwoods are being cut down. As of Saturday morning (June 17), three of the four cloverleaf loops have been clear-cut. Well, not quite, there is still one tree standing in the northern loop – it might be a different species, but there is no obvious reason why it has been spared. As of this writing, the western loop is still untouched (below right) and gives you one more chance to exit southbound 101 through a small but healthy urban forest. I suppose this is true if you think a field of stumps has the same “visual/aesthetic” value as a grove of living trees. 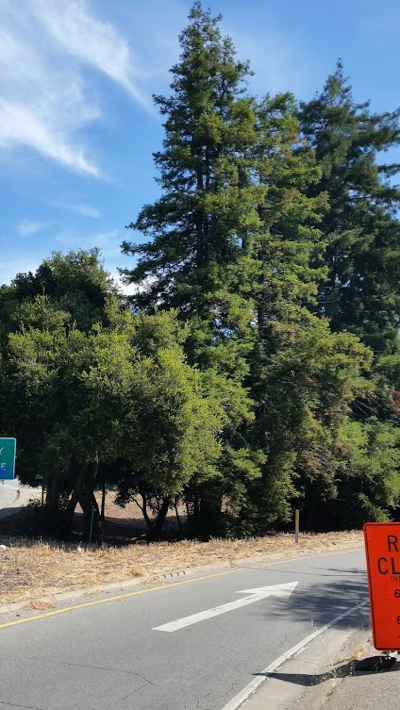 Will replacing redwoods large enough to be considered heritage trees in any other part of Menlo Park with the miniaturized shrubs currently in fashion as highway landscaping create a better visual entrance to the city? A declaration of “no effect on … animal species” seems to mean the hawks I have seen resting in the treetops are not significant. Nor are the pedestrians, who for the last few decades have had a bit of shade from summer sun on either side of the overpass. I expect homeless people have slept overnight under these trees from time to time; they are not significant enough for us humans to give them shelter, and it is to the trees’ credit that they made up for the lack. How is it that trees are not part of the “natural community?” These trees, like all others, have been absorbing CO2 their whole lives, not to mention dampening traffic noise and filtering diesel soot from the air before it reaches the lungs of my neighbors in the Willows. I guess the rationale is that these are non-“natural” landscape trees, and therefore considered disposable by highway planners. CalTrans, in its wisdom, has decreed that, like public employees on short-term contracts, these trees can be terminated at will. If CalTrans had better reasons than just to clear parking space for their construction equipment, maybe they could explain their thinking to the public. Please. As I passed through the interchange this past week, I saw stacks of redwood trunks cut into sawmill-size lengths. I hope that at least their value as timber (if not as living trees) was recognized and the State of California recoups the value of the lumber. And just maybe uses this un-budgeted income to replant redwoods that in only a half-century or so will restore this little scrap of forest. I confess that I have given these trees little thought in all the time I have lived in Menlo Park. Apparently, nobody else gave them any thought, either. Strong arguments have been made about whether the new interchange will be safer than the old, and whether it will make any difference to our congested traffic. Nobody has said a word for the trees, as far as I can tell. Where is the Lorax when you need him? While there are still a few trees standing, you might say “goodbye” the next time you loop around the cloverleaf at 101 and Willow on your way home. I plan to. Eric Sabelman, author of this post, has been a Menlo Park resident since 1979. We profiled him on InMenlo in 2011. Sad to see the trees mowed down. Being as the new exchange is being built to accommodate Facebook, perhaps they can spring for some new trees to be planted in place of the ones we have lost. It’s expensive, but it’s entirely possible to plant large, boxed, redwoods and oaks purchased from a tree nursery. Excellent letter. At the minimum we should insist that some redwoods be replanted once the construction is finished. It may take them 40 years to be modesty impressive, but it would still be worth it. A redwood tree can grow to 35-40 feet in less than 20 years. By the time a redwood tree os 40 years old, it’s very large. I agree the area should be replanted with redwoods, as well as oaks. If spectacular old growth trees can be spared, I don’t know why the answer isn’t always to save them. If cost is the factor, then that should be openly discussed. Certainly we would not discard a pet to have a place to park our truck, why then a life form that is older and as valuable to human well being. As a person that has resided in East Menlo Park for the past 20 years, I was deeply saddened to see the trees being cut as well. The trees were part of our community, and with them being gone so is some of the old essence. It is becoming too industrial. I was also sad to see the clear cutting of these trees. I have serious doubts about the benefits of this project. One of the stated reasons is to reduce the amount of cars that back up onto Northbound 101. I don’t see how introducing a signal and combining the traffic exiting to Westbound and Eastbound Willow road will reduce this back up. I also don’t see how this new interchange will improve the current congestion as traffic is merged to a single lane onto Westbound Willow Road. The merge is poorly located before the entrance to the VA facility. Moving this merge to the West side of this intersection would definitely improve the situation. I have also observed that many of the cars exiting at Willow Road are actually trying to avoid the interchange at University Avenue. Like many of the entrances to the city, Palo Alto traffic uses our streets because Palo Alto will not take responsibility for their own traffic. Westbound traffic consists of cars that will proceed to Middlefield and then turn left into Palo Alto, cars that cut through the Willows to reach Palo Alto, and those who merely make a “U” turn return to the University Ave exit, combined with a few that are actually entering the city. This is a lot of money and loss of trees to solve a problem that should be solved in Palo Alto. I’ve lived in Menlo Park for 20+ yrs in the Willows. There were many times, as I commuted home from work, taking 101 to the Willow exit, that seeing those tall, magnificent redwoods brought me joy. They made me feel like I was home. I too, imagined that they’d be there forever. The first time I drove by and they were gone, I felt angry and sad. Deeply sad. Why did they all have to be cut down? I’m still shocked and the new landscape reminds of other desert-like off ramps. I love Menlo Park for the trees, it’s one reason that I choose to live here. Even if Caltrain plants new trees it won’t be the same. I sent a link to my InMenlo letter to Robert Haus, Public Information Branch Chief, Caltrans District 4 [510) 286-5576, ]. His reply implied that CalTrans had no landscaping plan that retained any of the existing trees, despite a policy to remove the “minimum necessary.” He didn’t know that similar trees had been retained when the University Ave/101 interchange was remodeled a couple of years ago. It may be that CalTrans does in fact intend to save some of the trees. As I noted in my letter, there is one tree still standing in the north loop of the cloverleaf, and there is a clump of trees enclosed by tape in the west loop. I asked Mr. Haus if CalTrans surveyed these trees and decided not to cut them down. If so, why not say so? He has not responded yet.